Reviews and stuff for and about the world of online free music. This is the first album I’ve gotten around to reviewing from Mexican Net Label ‘Delhotel Records’, which is something to a surprise given the rather hefty back catalogue they can boast and the element of novelty entailed in finding a Mexican Net Label in a world of free music dominated by Europeans and Yanks. But I’ve finally gotten round to giving something from their extensive stable more than a cursory once over and I’m not disappointed that I did. ‘Katy’ is a full length album of laid back, gentle Indie Folk, with hints of Pop and Electro to offer some interest to an all too often dull genre. It’s by no means a work which is going to smack you around the ears and work its way onto a constant loop but there’s something comfortably serene about it and even when it moves to speed up the pace you’re still left with a laid back feel which comes across as perfect for lazy afternoons of being calm and content. Although on the negative side of that there are points where the serenity almost reaches of a point of atrophy and what you’re hearing seems more like a lullaby than anything you’d sit up and listen to. In itself not a bad trick to pull off but when the gentle melody of one of the doze inducing tracks gives way to a comparatively thumping Electro Indie track the mood gets blown for both. Production is fine, there’s nothing particularly spectacular being done but the emthasis seems to have been placed on getting the foundations laid perfectly rather than attempting to build anything particularly revolutionary. And the variety of moods brought in under the undeniable aegis of ‘Folk’ makes for a coherent but eclectic feeling whole. 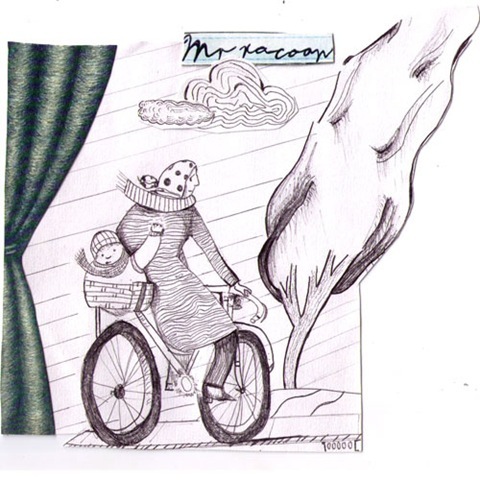 As for the vocals, well, they’re pleasantly inoffensive, following the lead of the music by fitting well into the whole rather than trying to stand out from it and Mr. Racoon (aka the impressively named Roberto Antonio Murguia Polo) has a voice that’s more than capable of doing it’s bit. Alas I can’t say much at all about the lyrics seeing as they’re in Spanish so I’ll just add that people should really start including multi-lingual text files of their lyrics where possible. Something which I’m sure that a label as seemingly organised as Delhotel would be capable of doing without too much effort and which would allow the non-Spanish speakers amongst us to get a load more out of the music than we can now. The Creative Uncommons is aliiiiiiiiiiiiiiiiiiiiiiiiiiiiiiiive!